After many years in industry, government, and academia, Joel Haight Ph.D., P.E. brings a wealth of experiences together to help him teach and lead engineer students at Swanson School of Engineering at the University of Pittsburgh. 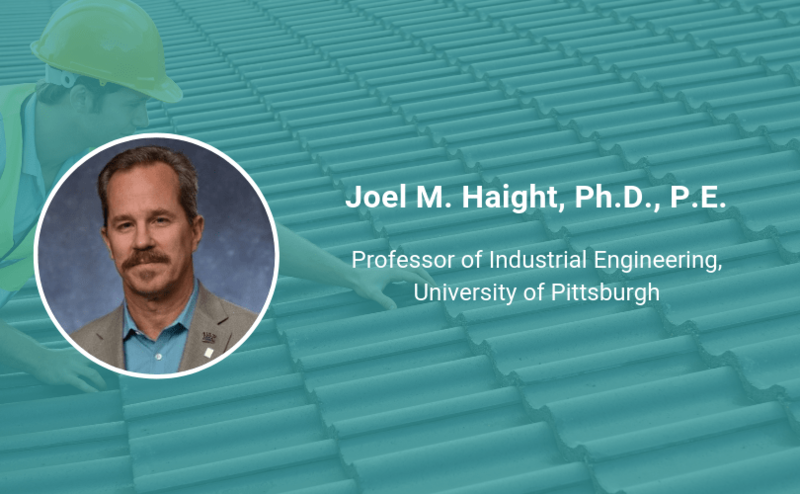 Teaching students everything from safety engineering concepts and design practices and beyond, Joel’s work as a professor helps to enhance students’ own capabilities, skills, and their approach to safety upon graduation. Keep reading to see what this Safety Hero wishes other people recognized in terms of safety and how he sees technology impacting safety in the years (and months!) to come. I am not directly in the safety field, but I have done a lot of work in that area because injury prevention is a responsibility of all engineers. I don’t know that I had a plan early in my career to become a professor, but after nearly 20 years in industry, I was looking for a challenge and becoming a researcher/professor has given me that challenge. Having come from the oil industry where safety is incredibly important, I was able and continue to use my industrial engineering background to help to improve or reduce risk in many industries. What do you wish other people knew, or would learn, about protecting and supporting workers in their jobs? I wish everyone would recognize that operational decisions can sometimes put people at greater risk of injury…it is not always just business. For those decision makers, I wish each would also consider risk when considering all process variables associated with their decisions. How do you think safety technology will evolve or change in the future? Technology will have a significant impact on safety and health…both good and bad…if we don’t properly manage the transition. It will in many cases, get workers out of harm’s way, it will replace unreliable humans, and reduce incident causing errors, it will allow us to collect much more information about the workplace, and then do better analysis on more data—however, our jobs will all change as we have to integrate with robots and autonomous systems. Change brings uncertainty and our human workers will become less able to do the job they once did, if something goes wrong and the computer isn’t programmed to handle the upset. It will be an interesting transition, but safety people should all infuse themselves into the tech transition and help guide the process so risk continues to be managed to tolerable levels.